Creativity in beverage development is sometimes a strange thing: at times you are researching for something specific and it just doesn’t want to “come your way”. I have been doctoring with a hot infusion of gin. I used different infusions in different bottles (and combined them afterwards). As mint is quite dominant in the Middle East, I have also made a lemon mint (vodka) infusion. Usually I would infuse herbs at a lower temperature, but as my Anova immersion circulator resided on work, and as I have been sous vide'ing already a juniper infusion at a higher temperature, I decided just to go along and add all infusions at one temperature (about 65ºC). After a couple of hours, I had a look and thought, that somebody played a prank on me: the mint infusion turned into a lovely and intense emerald green. But how? I thought, maybe it is the vodka, which solved the chlorophyl out of the leaves - hence I tried it at a lower temperature about 55ºC. However the effect has been quite the typical “mint tea color” - pale green with a lot of hints of yellow. I tried to research the issue in the "inter-webs", but haven’t been really successful. There were some research papers about chlorophyl - however they were based on far lower temperatures (room temperature or below) - and I am not sure, how this could work (getting the most of the color out of the leave). I haven’t though found any research or information in the web, how plant color is dissolving into an alcohol-water mixture at higher than 62ºC. It even seems, that there is a cap temperature (I didn’t particularly experimented with it, yet), as it seems that higher temperatures are deactivating this process - hence infusions at a higher temperature become again “tea colored”. Today I have repeated this process, however with tarragon. I believe, that tarragon is terrible underutilized in the bar. While other herbs like cilantro and sage appear from time to time in drinks (and I am sure, that those herbs are far less suitable), tarragon is exceptional but literally never seen. It is probably as useful (if not more useful) as basil. It has a very aniseed’y and fennel’y aroma, yet isn’t too strong in this department - for those Germans who are reading it: it has also a surprisingly strong hint of woodruff, though with a more adult character. Let’s see, which cocktail we will come up with this lovely infusion. Another application for this “sous vide magic” will be our (Noir at the Kempinski in Dubai) adaptation of the Gin Basil Smash. I hope that Jörg Meyer excuses my sacrilege to lay hand on his recipe - but I guess, that using less basil in the preparation, yet have a more pronounced color (and flavor) will suit this drink quite well - a Basil Smash 2.0 if you will. So peeps, I guess this was really a “world’s first” today. Probably distillers know this trick already for several centuries (I mean there are green “natural” absinthes and liqueurs around for ages) - but in the bartender world, I didn’t found one person who utilized this specific technique. If or when you are using it, please do not forget to refer, where you have heard it first! 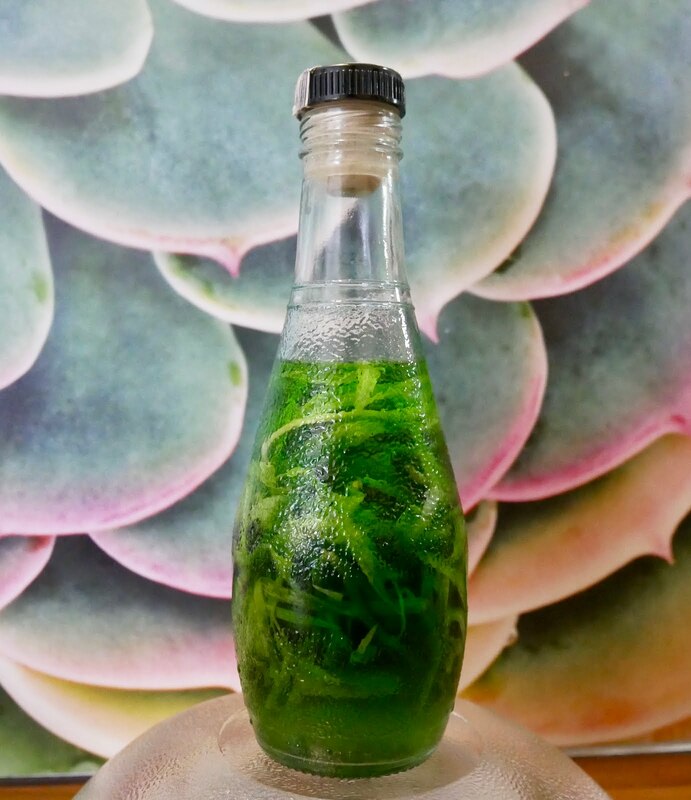 First: infuse alcohol with green leaves at above 62ºC (I used 65ºC). After some time (the color infusion happens relatively quickly - not sure about the taste though) take the infusion out of the water bath and directly put it into a cold water bath (I have chilled the typical warm Dubai tap water with ice). Then strain and be proud, that you have done something really magical.